This month, seminars on Handling Special Customers are respectively being conducted across all SM Malls and in SM City San Pablo in Laguna. 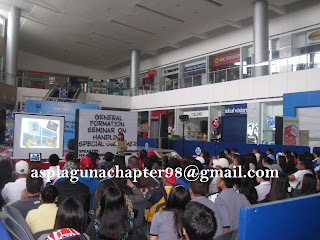 SM City San Pablo together with DSWD and Autism Society Philippines, Laguna Chapter once again steered a formation seminar making sure that our front liners such as janitors, security guards and employees are knowledgeable in giving special attention to customers with special needs. All 135 participants from SM City San Pablo were given an overview of the stigma and major challenges of people with special needs. They were also oriented on how they can properly deal with them. All of these efforts making SM a catalyst for positive social change in the country. SM Malls are now venues in showcasing the ability above the disability. Autism Society Philippines coined the term “SM is for persons with Auti- SM”. This emphasizes that the mall is a safe venue for people with special needs. Same goes to our Senior shoppers; making sure that they enjoy the mall with great comfort and relative ease. The main goal of leading seminars like this is to help our patrons with special needs in living healthy and productive lives as contributing citizens and make them feel part of the society. Making SM a mall for All.